person who stood on it wad wearing sharp heels and stood right where the toenail ends. Anyway a few days passed by and didn't think of it at first as it showed no serious systems just toe pain. However, I've recently noticed that the exact place where the person stood on me, I've developed a blue/green blotch under my toenail. I haven't had any fungal infections on my feet or toes in the past so I'm assuming it's to do with the injury. 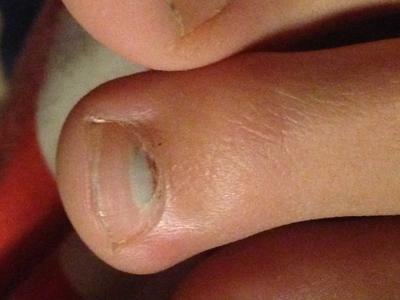 All I really want to know is can my toenail ever going to go back to the way it was and what treatment can I get for it? I think it is safe to say that the discoloration in your toe is the result of the trauma you incurred from someone stepping on your toe. The question becomes one of what are you going to do about it, if anything? Making the assumption that the discoloration is self limiting, meaning it does not get any worse, you can assume the discolored portion of the nail will grow forward and within three to four months will be at the end of the nail and can be cut away. Here's the rub. Besides fungus or bacterial infections from women going to nail salons, the next biggest culprit is trauma to the nail. Over the years, I cannot begin to tell you how many people have presented to my office for whatever condition and I will notice a disfigured nail and they will proceed to tell me how it is the result of trauma from years ago. By the time I see them, the nail is so distorted that it is impossible to offer any real treatment. Based on where the discoloration appears we may be able to assume that the growth plate of the nail is not affected. That would be in the area where the back of the nail meets the skin. Many times trauma to that area will permanently destroy the nail regardless of what you do. So...if this issue concerns you enough, I would suggest you consult with a podiatrist or a dermatologist. If you came into my office, using a high speed burr, I would drill into the nail where it is discolored to get a better idea if it is fungal or bacterial in nature. Drilling through the nail should not be painful. Sticking a needle in there will probably not work as the material under the nail has probably dried out at this point. I would clean out as much as the discoloration as possible and either start you on a topical anti-fungal or antibiotic depending on the type of infection. I would continue to have you use the topical medication until that area has grown out. Once grown out the nail should be re-evaluated to see if any further treatment is necessary.